A strong demand for computer science (CS) professional development exists in the Bay Area. Parents are requesting that schools offer CS courses, but few teachers are appropriately trained to teach CS. Even though California has not completed its computer science standards for education, it’s clear that teachers are interested in how they can integrate CS in their classrooms or prepare themselves to teach CS courses. As a result, KCI conducted three well-attended CS Crash Course programs—two locally and one at the Pathfinders Summer Institute, an intensive week of in-person professional development in CS and Making held at Indiana University/Bloomington and sponsored by Infosys Foundation. Over 70 teachers participated in the three programs. KCI sees the demand at two levels. 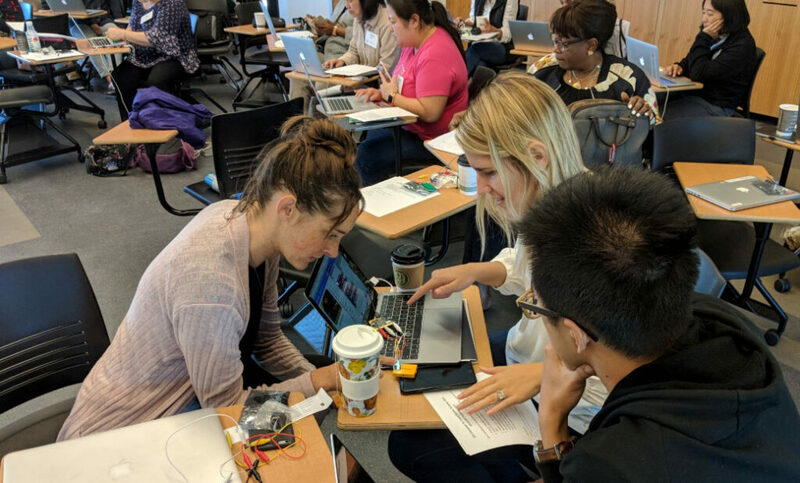 Elementary teachers are interested in learning how to integrate CS principles and coding into various subject areas, especially math and science. And middle and high school teachers are interested in taking the additional courses needed to earn a California Supplemental Authorization that allows them to teach stand-alone CS courses. KCI also works with teachers who already are qualified to teach CS, but are still unsure about the pedagogy needed to be successful. KCI’s CS Crash Course, a 28-hour program, addresses these educator needs. One of the main goals of the Crash Course is to show teachers that CS is more than coding. Topics covered during the program include algorithms, data, internet and the impact of computing. The impact of CS in several fields is demonstrated, and the participants gain practice in computational thinking and the problem-solving aspect of CS. And yes, they do learn to code. This summer the participants could choose between Scratch or Python coding programs to use for their projects. They also had the opportunity to code more complex problems independently by learning best practices in coding, and how to debug code. Besides building confidence in the CS concepts and coding, the program also models successful teaching practice since it is designed and taught by teachers who are active in middle and high school classrooms. The instructors effectively demonstrated lessons coupled with discussion on specific challenges faced in teaching CS. Differentiation strategies to deal with both struggling and advanced students, the use of collaboration, and projects that include choices and engage all students including girls and minorities were specifically discussed.